What every Marylander, American, and human should know. 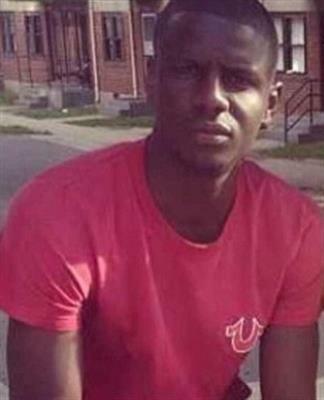 Freddy Gray is a twenty five year old Black man who died in police custody. A lifelong Baltimorean, he leaves behind two sisters, one of them his twin. when the car arrived at a police station approximately 30 minutes later. Gray fell into a coma and died in one week. Where and when did this all take place? Police arrested Mr. Gray on North Mount Street in Baltimore, MD at 8:42 AM on Sunday, April 12. He died while hospitalized at the University of Maryland Shock Trauma Center on April 19. The cause of this injury is still unclear. Video shot by a bystander shows officers dragging a partially limp Gray into the police van, but does not show an altercation. Witness Kevin Moore describes the arresting officers as "fold[ing]" Gray up "like he was a crab" with his legs bent backwards. "None of the officers describe any use of force." Like so much of this tragic case, the answer to this question is disturbingly vague. Official documents say that Gray was was carrying an illegal switchblade. The six officers involved in Gray's arrest have been suspended with pay. Thousands of protesters have marched in Baltimore, including at least two thousand on Saturday, April 25. A small minority of these have turned violent, smashing windows on cars and businesses. It appears that police also contributed to the violence, beating a photographer from the Baltimore City Paper. How can future deaths be prevented? Sadly, Gray's death is not an isolated incident. In light of Freddie Gray's death, Governor Larry Hogan has called for police body cameras to record disputed incidents and hopefully deter violence. "How are [the police] going to view the people with empathy?" For a city in pain, not an easy lesson to teach.